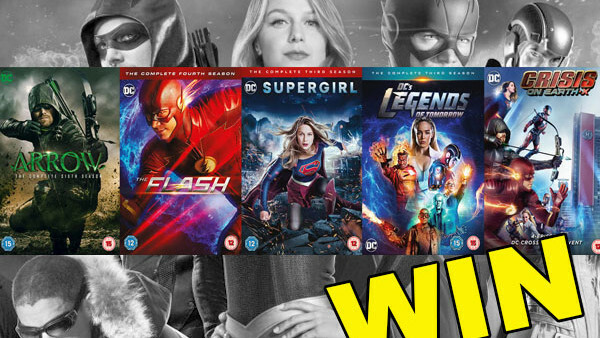 We have 3 to give away including Arrow, Crisis On Earth X, Supergirl & More! To celebrate the latest batch of releases from DC TV’s Arrowverse, out throughout September on Blu-Ray™ & DVD, we’re giving away three bundles including Arrow: The Complete Sixth Season, The Flash: The Complete Fourth Season, Supergirl: The Complete Third Season, DC’s Legends of Tomorrow: The Complete Third Season on Blu-Ray™, plus the four-episode crossover event Crisis on Earth X on DVD to three lucky winners! DC TV’s Arrowverse stars Stephen Amell as Oliver Queen/Arrow, Grant Gustin as Barry Allen/The Flash, Melissa Benoist as Kara Danvers/Supergirl, Victor Garber as Martin Stein/Firestorm, Brandon Routh as Ray Palmer/Atom and Caity Lotz as Sara Lance/White Canary. Arrow: The Complete Sixth Season is out now on DVD and Blu-ray™, order now. Crisis On Earth X is out now on DVD, order now. Supergirl: The Complete Third Season arrives on DVD and Blu-ray™ on 17th September, pre-order now. The Flash: The Complete Fourth Season arrives on DVD and Blu-ray™ on 24th September, pre-order now. DC’s Legends of Tomorrow: The Complete Third Season arrives on DVD and Blu-ray™ on 24th September, pre-order now.